We already mentioned it when we described our IJwit, celebrating its fifteenth anniversary last week: malt. The germinated cereal grain is indispensable to brewers. Together with water, hop and yeast, it forms one of the main ingredients of our beloved drink. As the influence of wheat malt on the taste of a wheat beer like IJwit shows, malt offers great possibilities. The specific type of malt has a decisive influence on a beer’s alcohol percentage, taste and colour. Yes, that is quite a technical story. In order to create alcohol, sugar is needed. Grains though, do not contain any sugar. But it does contain starch and enzymes, which can transform that starch into sugar. Before that can happen, the enzymes need to be activated. That happens in a maltings or malt house, where a warm, moist environment tickles the enzymes into active mode. Normally, they would use the starch as the fuel with which they would help the grain to sprout. As brewers need both the enzymes and the starch for brewing, the grain is dried before the grain starts to sprout. After the grain is dried, it is officially malt and ready for use in brewing. In order for the enzymes to start turning starch into sugar, the malt needs to heated in water. What type of sugar it extracts from the malt, depends on the temperatures. Different types of enzymes are activated at different temperatures and extracts different types of sugars from the malt. This is important, as some of these sugars are very easily fermented, while others are not. The former will result in a higher alcohol percentage, whereas the latter will make a beer taste sweeter. So, this is the way malt determines the taste of a beer then? Yes, but just partially. A large amount of unfermentable sugars will result in a very sweet beer but malt does affect a beer’s taste in different ways too. Barley is the most malted type of grain but other grains can be used too. They can endow a beer with a fundamentally different taste, as the case of the wheat malt in our IJwit shows. We used rye malt once for a beautifully brown and soft IPA once, for example, and brewed a great bock beer with it too. Besides the amount of sugar and the type of grain, a beer’s taste also depends on how the malt is dried. Most malt is shortly dried with hot air and retains its pale colour. Increasing the temperature of the air and the length of the malt’s exposure to it, results in roasted varieties. They range from the slightly roasted cara malt to the deep dark malts used in porters and stouts. The taste of roast is most prominent in the latter category. They way in which these malts are dried is somewhat similar to the way in which coffee and chocolate are roasted and thus provide a similar taste. If you ever tasted our Ciel Bleu Imperial Stout you know what we are talking about. Correct. The husk of the malt is also used and when it is of the roasted kind, the water will extract its colour. Our Columbus gets its amber colour from a bit of lightly roasted malt. Our darker beers, such as Natte and Struis, have clearly been brewed with loads of deep roasted malts. Interesting story but a bit hard to picture how this al works in practice. Well, in that case you might like to watch the video we once made about the long journey of the malt that we use. 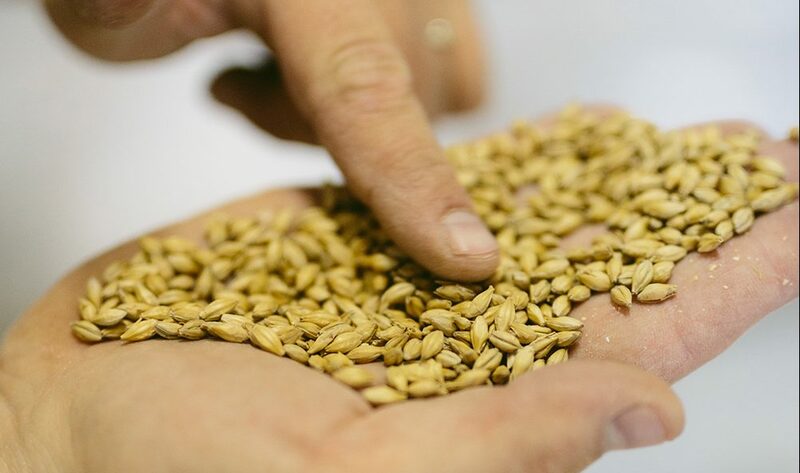 You see the grain arrive at the Belgian malt house of Dingemans, how they turn it into malt and how it then finally is grinded before use at our brewery in Amsterdam. You could also take a tour in our brewery underneath the windmill. We conduct them at Fridays, Saturdays and Sundays, which happen to be the days we do not actually brew. But someone will explain you a lot about the way the different ingredients are used when we do brew. You can see the differences between the different types of malt and if you are lucky you might even taste some. Yeah right. See you soon? Van mouterij Dingemans naar Brouwerij ‘t IJ from Brouwerij ‘t IJ on Vimeo.